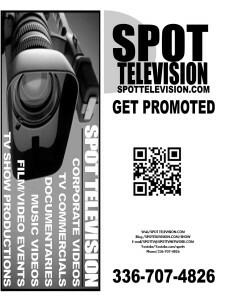 SPOT Television Entertainment is expanding our Network. benefit from the establish network, web presence and Television programing currently in operation. ▪ Support of Social Media presence for those members who do not have time, skill or ability to manage social media. This opportunity is available to any business owner, organization, or event promoter. It is exciting to be able to promote my business at such effective cost. The SPOTTV name is a recognized brand in the United States and it is great to be associated with the brand. SPOT TV looks forward to partnering with leaders in Eastern North Carolina to bring the information important to our community. Wilson, NC located in eastern North Carolina now has a community affairs program that covers local events and personalities. The first episode features the Honorable James Baxter Hunt. Esteemed former governor of North Carolina who is from Wilson County. The program also features The Ride For Cancer that uses a horse riding trail platform to educate and inform residents of the importance of cancer research and finding a cure for Cancer. Viewers may recognize many familiar faces including Howard Jones Founder and Director of Wilson OIC. A musical selection by Freddy Cole Legendary Jazz Musician captures spirits with the timelessness of his performance. “It is exciting to bring community events and spotlight community leaders in Wilson County and North Carolina” Troy Jones, native Wilson County resident and producer/ editor of SPOT TV. SPOT TV looks forward to partnering with Wilson County Residents and leaders in Eastern North Carolina to bring the information important to our community. You can view SPOT TV in Wilson, NC Daily at 7:30am and 4:30pm. Already a good year. Spottv is airing in more markets and we are offering more opportunity to share community events and positive entertainment.